This FREE 37-page guide introduces players to the ZEITGEIST adventure path, with background information, character options, maps, and more. 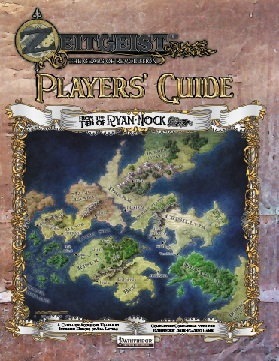 This Player's Guide is completely free. You are welcome to distribute it amongst your friends. This product is full of incredible crunch, Fluff, and Art all in one. The main purpose of the product is sort of like the Player's guides for Paizo's Adventure Paths, but that severely undersells what you get in here. EN Publishing has built up an entire world where guns are commonplace, technology has advanced into the industrial revolution and the center of the world is a city of immense proportions. They do this not just through fluff and description, but also through crunch and beautifully painted color art. For example, the standard 2 traits you would get at character Gen in a Paizo path have been replaced with a "Character Theme" which gives you a specially created feat scaled to match with the other theme feats (rather than other feats in general). anyone can take any theme feat but some (like the gunsmith theme feat) are obviously better for certain types of characters. These feats help to establish a character's role in the world, as well as opening a player's first real window into a world where technology and magic are beginning to meet in earnest for the first time. That's just one example among many however. I'd continue, but in the time it took for me to list them all, you could have just downloaded the PDF here already and gone through it yourself. Since the PDF is free, I recommend you do just that and get a taste of what EN Publishing has created in this setting. Excellent player's guide, also great to mine for ideas/for the crunch! This pdf is 37 pages long, 1 page front cover, 1 page editorial, 1 page ToC, 1 page SRD and 1 page back cover, leaving a total of 32 pages of content, so let's check this out! Beyond providing a central theme for each character, these feats add roleplaying potential galore, coming not only with the usual crunch, but also with a rather extensive fluff-section - If you need a general overview of the quality you can expect, take the Eschatologist's feat "Icy End of the World": It not only enables you to generate a zone of icy cold that deals character level damage to all inside (including you) and makes healing impossible, it can also be used to stabilize and even resurrect PCs that have fallen in the last round. Or take the feat "The Man with two Guns is God" for Gunsmiths, that enables the user of the feat to attack with firearms as if you had two-weapon fighting and quick draw and even better, not provoke an AoO when drawing and attacking in the same round. Spirit Mediums can talk to the dead as a spell-like ability and even conjure up a spirit to perform a standard action at you behest. The theme feats are brilliant, smart and iconic and add some rather cool additional angles for the players to explore. The player's guide also provides guidelines regarding firearms and treasure, vehicles, organization prestige and the options to secure minor help by NPCs in your endeavors. The second chapter details the setting overview, including a section on the planes, wild and dead magic zones and the basic details of all the countries as well as sections on the dominant religions and philosophies. The third section of the book details the metropolis of Flint, where the AP kicks off - capital of Risur, home to the PCs and beautifully cartographed, this section is awesome indeed - have I mentioned the fully-stated mage-shackles? Since the Zeitgeist AP will juggle a lot of NPCs, the final page is devoted to NPC-mugshots and short run-downs of the respective characters. Editing and formatting are top-notch, I didn't notice any glitches. Layout adheres to a 2-column, full-color standard with fitting borders and the artworks, oh boy, the artworks are AWESOME and should fulfill the needs of even the most critical person, being on par with Paizo, WotC etc., perhaps even beyond that in a couple of them. The pdf comes with no bookmarks and unfortunately, without a printer-friendly version - the pdf will extol a brutal drain on your printer. This is a player's guide after my tastes - with stellar crunch, great background stories, no spoilers and a plethora of great hooks (via e.g. the theme-feats) to deeply entrench your characters in the world of Zeitgeist. Am I stoked? Hell yeah! 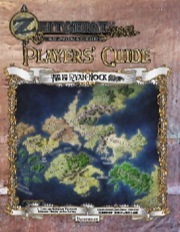 While the lack of a printer-friendly version is a major blemish in my book, this player's guide is free and of a higher quality than most commercial publications. Furthermore, the concepts and rules of e.g. the theme-feats can easily be scavenged, providing goodness even if you don't plan on running the AP. Hence, my final verdict will be 5 stars + endzeitgeist seal of approval. Essential reading for anyone interested in the Zeitgeist Adventure Path, and with it being available as a free PDF download with the option to purchase a printed version if you prefer, it's quite safe to say that! Starting with some evocative fiction to set the scene, a brief Introduction explains the contents of this work - aimed at players and GMs alike - and gives a brief pronuciation guide, which makes everything sound like Welsh pronounced with a strong American accent! There's also a note that, despite the underlying theme involving tension between industrial/technolgical advances and magical tradition, those who don't like tech in their fantasy can substitute either arcane magic or psionics for technology, with their 'traditionalists' being divine spellcasters. Likewise, although the game is set squarely in its own setting, you can adapt it to take place in another alternate reality of your choosing. The next couple of pages repeat the contents of the Player's Primer, describing a little setting, background and timeline, and presenting a map. Section 1: Characters covers what you need to know to create characters suited to the setting and campaign. The default assumption is that characters are members of the Homeland Constabulary, but if preferred, they may work for some other law enforcement agency or be hired in by the Constabulary as specialists. Basically, it's possible to play just about any race or character class that is available in standard Pathfinder games, although some will be quite unusual here or may need a little work to fit in. Clerics are rare, as there are no established churches and deities tend to be less involved in mortal affairs than in some settings; but druids and oracles abound. Just about all magics work, apart from long-duration flight and planar travel, and dragons are presumed to be extinct. Technology is quite low-impact, aside from a sooty atmosphere, most noticeable in this new-fangled railway and some primitive firearms, muzzleloaders in the main. The discussion moves on to the really neat innovation of character 'themes.' These are background and flavour options, which work mechanically in a similar manner to traits, only you may have just the one theme. All fit well with the setting of this campaign, and may need changing if you intend to tamper with it. Nine themes are on offer, each offering an interesting angle. For example, there's the Docker, who is not a mere stevedore but a member of an informal and innovative artistic movement. A bit anarchistic, they favour impromptu performances of music, graffiti, stand-up or even freestyle philosophy. Both Gunsmiths and Martial Scientists are fascinated by the fusion of technology and combat, with the former specialising in firearms and Martial Scientists taking a formal analytical approach to warfare itself. As you can see, the themes allow you to choose your character's whole approach to life, rather than a profession or allegience. There also are details of income, and of the novel contraptions and substances available to spend it on - even recreational drugs if that's your character's thing! Then comes a system of 'Prestige' which is a reputation-based method for determining how easy it is for a character to obtain unusual items or call in favours, necessary arts in navigating the bureaucracy inherent in an organisation like the Constabulary. Next is Section 2: Setting Overview. Here's the stuff your character knows, because he grew up there, neatly summarised for the benefit of players who didn't. The action is centred around the subtropical kingdom of Risur, where emerging technology vies with ancient magical heritage, and its relationships with neighbouring states. Cities, nature, cuisine, religious belief, and more are covered - and for those who want to get deep into character there's even suggestions for adapting real-world accents to different nations so they actually sound different! There's a lot here and it will repay careful study, so as to become embedded into this alternate reality and see it come to life in your game. The Royal Homeland Constabulary serves to protect Risur from any threat, internal and external, and is said to use any means legal or otherwise to achieve its ends. There's plenty about other lands as well, to facilitate playing characters who come from there or to inform trips abroad. Finally, Section 3: Flint looks more closely at the dominant city of Flint, the technological capital (although not the legislative one) of Risur in which at least the initial stages of the campaign are to be focussed. Characters are advised to get to know it well, and there's a map and gazetteer to aid you. There is also detail on the organisation, responsibilities and powers of the Royal Homeland Constabulary, and a selection of key NPCs characters will encounter in the adventures to come. It's an excellent overview of a well-designed setting that leaves you itching to create a character and dive on in, an excellent way to get everyone eager to play or GM the campaign to come! I would love for someone from En to weigh in, but is there a way to get a little cleaner look at some of the information for the setting. I had to do a document search to see if there was a reference to halflings or gnomes. Halflings popped up once and Gnomes didn't pop up at all. Some sort of racial entries type set up would have been wonderful. I felt that the opening section was doing a good job of "you want this race check this section" but partway through it dropped several races from the core pathfinder book namely halflings and gnomes. I assume halforcs are over in Ber. That's about my only pet peeve was not being able to find quick info on which nation has which race and such. EDIT: Something I also noticed Dragonborn do not exist in Pathfinder, neither do Goliath or Shifters. Obviously one can scrap those and make it almost entirely orc populated toss in goblins, hobgoblins, and bugbears to round things out. And Minotaurs can always be doctored to better fit a Pathfinder game. And reviewed here, on DTRPG, posted about it on RPGaggression and sent it to GMS magazine. Cheers!